Its been a while since I posted a blog, but they are coming. This speach by Rep. Forbes was just too good to pass up. Check it out. I am asked often “What do you do every day?” Here’s a glimpse of a semi-completed project I have been working on daily for over 2 years. There is not enough room on this site to bore you with all the details (including numerous ups and downs) of how we progressed to this stage, but I’ve profiled the Daytona Live! project in Daytona Beach a few times on this blog – here and here and here. With construction now “vertical,” everyone on the outside is beginning to see the fruits of our labor. The office building, which will be the new world headquarters for International Speedway Corporation, NASCAR and Grand Am, is under construction and changing the landscape of W. International Speedway Blvd in Daytona Beach. I snapped a few quick pics this morning so you could see the building a few months into construction. 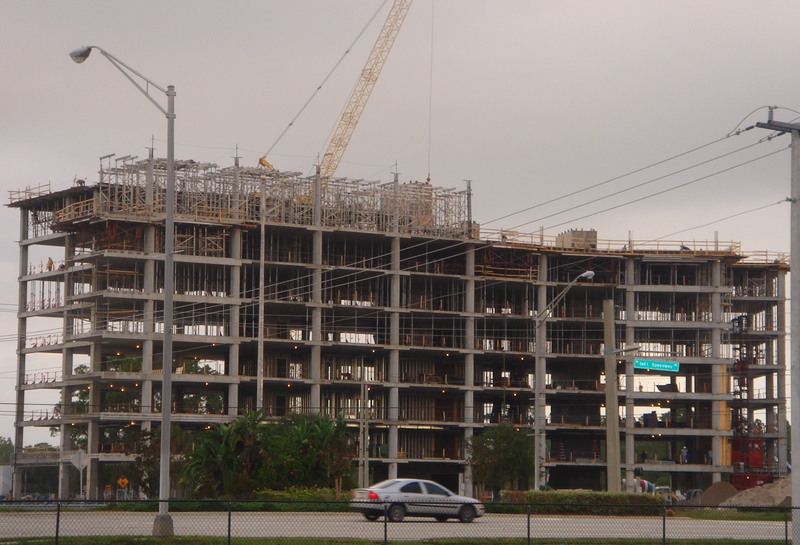 When complete, it will be 185,000 square feet spread out over 8 stories. The other construction project I have been involved with on the fringe is our new church in Ormond Beach. Troy has dedicated his blog to progress on that project, so click on this link if you want to see the progress there too. There are other aspects of my work that I will blog about in future posts, but there is a look into a project that has consumed the better part of 2 years! Had a good (and funny) conversation with a few friends the other night about “how to find a man.” I’ll describe them as a few young, single and looking young ladies. I’m no expert on this subject (my wife would probably be better suited to discuss), but I tried to give them some advice from ”the man’s perspective.” The best thing I could tell anyone about tying the knot is two fold 1) find the right person (see the video below) and 2) don’t get married until you are absolutely ready. #2 may cause a strain on your current relationship, but I think it is critical that you do what you want/need to do before you make this lifetime commitment. Sometimes doing those things will even help you find your mate. Once you’re married, it’s no longer just up to you – to maintain a successful marriage every decision becomes a joint decision. I needed to do things like live in DC and work on Capitol Hill, finish my undergrad and law degree, travel, and establish my career. The time it took me to get to the altar may have been too long for my bride (just ask her, she will tell you all about it), but it was critical for me. The following video is from New Spring Church. It was aimed at the guys, but I understand from Tony Morgan’s blog that the women in attendance like it the most. LL and EN, this entire post (and video) is just for you!